After 1600, English emigration became one of Europe’s most significant population movements. Yet compared to what has been written about the migration of Scots and Irish, relatively little energy has been expended on the numerically more significant English flows. Whilst the Scottish, Irish, German, Italian, Jewish and Black Diasporas are well known and much studied, there is virtual silence on the English. Why, then, is there no English Diaspora? Why has little been said about the English other than to map their main emigration flows? Did the English simply disappear into the host population? Or were they so fundamental, and foundational, to the Anglophone, Protestant cultures of the evolving British World that they could not be distinguished in the way Catholic Irish or continental Europeans were? With contributions from the UK, Europe North America and Australasia that examine themes as wide-ranging as Yorkshire societies in New Zealand and St George’s societies in Montreal, to Anglo-Saxonism in the Atlantic World and the English Diaspora of the sixteenth century, this international collection explores these and related key issues about the nature and character of English identity during the creation of the cultures of the wider British World. It does not do so uncritically. Several of the authors deal with and accept the invisibility of the English, while others take the opposite view. The result is a lively collection which combines reaffirmations of some existing ideas with fresh empirical research, and groundbreaking new conceptualisations. 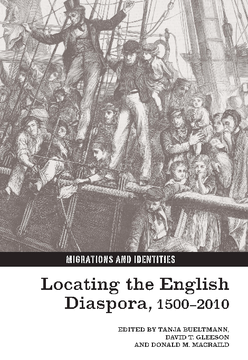 After 1600, English emigration became one of Europe’s most significant population movements. Yet compared to what has been written about the migration of Scots and Irish, relatively little energy has been expended on the numerically more significant English flows. Whilst the Scottish, Irish, German, Italian, Jewish and Black Diasporas are well known and much studied, there is virtual silence on the English. Why, then, is there no English Diaspora? Why has little been said about the English other than to map their main emigration flows? Did the English simply disappear into the host population? Or were they so fundamental, and foundational, to the Anglophone, Protestant cultures of the evolving British World that they could not be distinguished in the way Catholic Irish or continental Europeans were? With contributions from the UK, Europe, North America and Australasia that examine themes as wide-ranging as Yorkshire societies in New Zealand and St George’s societies in Montreal, to Anglo-Saxonism in the Atlantic World and the English Diaspora of the sixteenth century, this international collection explores these and related key issues about the nature and character of English identity during the creation of the cultures of the wider British World. It does not do so uncritically. Several of the authors deal with and accept the invisibility of the English, while others take the opposite view. The result is a lively collection which combines reaffirmations of some existing ideas with fresh empirical research, and groundbreaking new conceptualisations. Dr Tanja Bueltmann is Senior Lecturer in History at Northumbria University and co-editor of Locating the English Diaspora, 1500-2010 (LUP, 2012). Dr David T. Gleeson is a Reader in History at the University of Northumbria. Don MacRaild is Professor of British and Irish History and Head of the Department of Humanities at The University of Roehampton.